Have you ever wished for a star of your very own? The young boy in How to Catch a Star wishes he had a star all his own and sets out to catch one. The story, by Oliver Jeffers, is super cute and can inspire lots of learning opportunities such as a science-related study of stars, star- or wish-themed writing activities, an investigation of character/personality traits, a discussion about goals, and much more! And yes, the book is part of this month’s giveaway. What else is included in this month’s First Friday Giveaway? Let’s see. 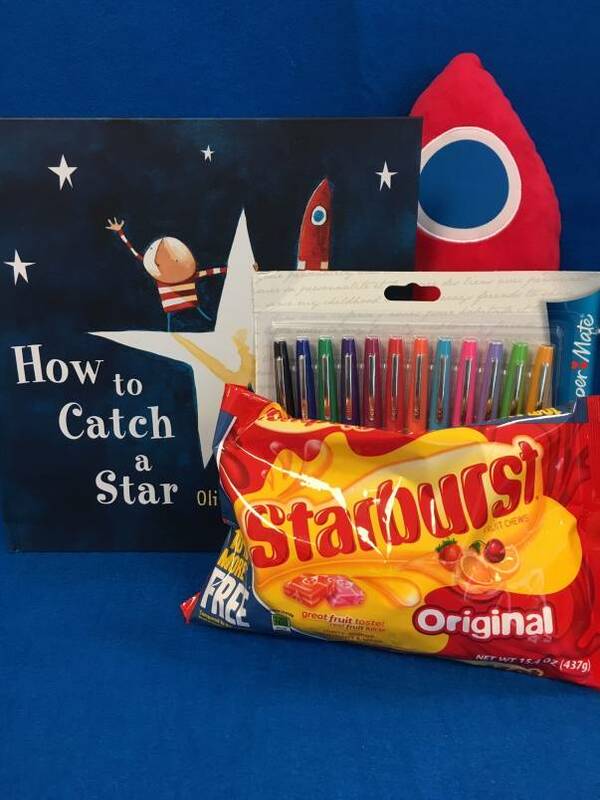 There’s a plush spaceship that is begging to be placed in a writing center or reading corner, a pack of smiley star stickers, a bag of Starburst candies, and a pack of 12 colorful flair pens. To enter for a chance to win this star-studded prize pack, leave your answer to the following question in the comment section of this blog before midnight April 15, 2019. What’s a wish of yours? I wish that my students feel they are superstars. I wish that I could provide all my students identified with special needs the self-confidence and self-assurance to complete state tests. I wish that my students will always love to read. I wish we could have an updated library always! hmm That this world becomes a little kinder, a little less chaotic so the littles I teach now and in the future will not have to endure some of the craziness we have recently! I wish I had more time for read alouds in my classroom. I wish my grandkids to grow up to be successful, happy, and well-liked adults ???? I wish all of my students would realize how special they really are! I wish to be a winner of this star give away :). On a more serious note, I wish for more tolerance among humans and great leadership of our country. I wish I had the money & the room to buy more books! I wish for my students’ happiness and health! I wish people would stop having children if they cannot properly care for them. And I also wish parents would educate themselves on how to feed their children healthy foods and snacks, instead of giving them processed foods and snacks. For my students, I wish they all had someone to read with them at home. I wish I could get it all done! I wish everyone (kids and adults alike) could feel valued, appreciated, protected and loved! I wish that I can make a difference in the lives of every student who has been in my class. I wish them future success and happiness. I wish I had more time to read yo my half day Kindergarteners! I wish for my students to become happy, healthy, confident and responsible adults, who will enjoy reading the rest of their lives! I wish that all students knew that they were loved and felt enough hope to wish. I wish for my students to feel the lice and sorry they need at school and home. I wish that all my students would love to read! I wish to always be a passionate learner along with my students. I wish that all of my students feel loved and safe when they are with me. I wish that learning could be fun for everyone! I wish I can give everything to my kids that they need to feel wanted in every way. I wish I had time for more purposeful play in my classroom! I wish for a peaceful day at school! ???????????? I wish everyone had unlimited access to books and of course, the motivation to read them. I wish money was no object! I wish that by sharing good books with my students I am making lifetime readers out if them. I wish that I was better organized so that I didn’t spend so much time looking for learning materials to use with my class. I wish all children would feel loved and accepted and have enough to eat. I wish all of my students will always have a love of learning. I wish my children and my students to be successful!! I have a wish to travel abroad with my children. I wish that I could be the most effective teacher for each of my students. I wish I could make learning fun and memorable for every child. I wish all my 3 year old students will continue to grow and love learning. I took over this class 2 months ago and am amazed at how well they adapted to the change. I wish for happiness and peace among people. I wish to be remembered as the crazy teacher that always brought suspense into their world through my teachings. Like the day we boarded the ship to America, When Mrs Emma Willard Hart came from the past into our present time to tell the students about school back in her days, or the day Ms. Sowa and put together our own Crime Scene Investigation for them to solve. I wish for an end to child abuse. I wish that my students would all love to read. I wish I knew the best way to reach all my students. I wish to remember to take time for my kinders because it’s the little discoveries and hurts that mean so much when someone notices. I wish for a school environment where everyone feels safe and ready to learn. I wish my roof didn’t leak. I wish general ed students treated each other better. I wish everyone on this planet had the right to education, to read and to write!!! I wish that parents would appreciate and understand what we are trying to do. I wish for my students to have more “aha” moments. I wish for them to see the power of contentment while still striving to be their best! I wish all my students know they are bright stars! My deepest wish is that my students understand how very much I care for them and want the best for them. I want them to know how unique and wonderful they are exactly the way they are. I wish that child care teachers were thought of and treated as real teachers. I wish that all of my students had a love for reading! I wish that my students felt safe when they went home. I wish for my child to have more play based learning in his class. I wish for more time to do the things students love to do in class (read, create, imagine, etc.) and less curriculum forced upon them before they are developmentally ready ….sigh! I wish all my students enjoyed reading as much as I do. I wish I had an extra day every week, I always seem to be a day behind. I wish I could have unlimited books for our library, so my kids could reach for the stars in reading! I wish I had more time to get everything done for all the behind the scene things. I wish to never lose my love of teaching. I wish I could help each of my students could realize how much potential they have. I wish our staff could spend more time together! I wish for children to see how special they each are and for them to be loved and read to every day! I also hope for time to relax and renew amid the weekly busyness. Having time to meet the needs of all my students. I wish I had endless patience and energy. I wish for my children to find their passions. I wish that every child would have enough food to eat and a loving home live in. I wish for a world of kindness and peace. I wish my students could be kinder to each other…instead of arguing and annoying other people on purpose. I wish that all my students try their best on the state testing next week! I wish for all of my students to make progress on their goals. I wish that testing goes well. I wish that all of my students would always try their best! I wish that my kids have a happy, productive lives. That they get a chance to feel the highs and lows of life. And Know that I will always love them. I wish that I could always create a fun hands on learning environment. I when I had an endless supply of funds for classroom materials. My wish is for my students to feel loved and cared for. I wish that every parent, teacher, friend and stranger encouraged reading for the sheer joy of all the adventures that books offer, both inside the pages and beyond the book. I wish that I can finish my masters one day! I wish education was important again…something cherished and treasured. I wish that everyone would be a blessing. I wish I could just teach and not worry about constant testing and data. I ask God everyday: I wish that all children have love and happiness. That they ;live a life of peace. That they feel safe not only in school, but throughout their journal in life. That they gain self wealth and to know that they are all important and valued. I wish kids had more time to just be kids. I wish that my students believe in themselves as much as I believe in them. I wish that all students had a positive and caring attitude. I wish for everyone to be healthy, happy and kind to each other! I wish that the state of Oklahoma would better fund education and make my students their priority! I wish for all my students past and present to see the very best in themselves and see the potential they have and that they always reach for the stars. I wish for peace and happiness for everyone. I wish for my children to be happy, well-adjusted people. I wish that my son and my students grow in peace, happiness, and success in their own special ways. To raise lifelong readers and explorers. I wish for my boy’s to grow up loving to learn and be kind to others. I wish for a kidney transplant, so I can be the best teacher I can be! I wish that my students know much they mean to me and that I will somehow leave a lasting impression upon them. My wish is for all students to have the best learning environment. I wish I had more time to put together and implement my classroom ideas. I wish for my students to love playing outside, board games, and reading books more than playing on tablets and watching tv. I wish our government would realize the children are our future and to start putting education first. I wish my kids felt safe playing outside, so they could explore what nature has to offer. I wish to pass edTPA and the GACE test so I can be a certified teacher. I wish my students understood how important they are to me. I wish to leave my students with the knowledge that they deserve to be heard, that they are valued, and that they make a significant impact everyday of their lives! I wish that each student had a loving home life. I wish that each one of my students knew how much I truly care about them. I wish they knew how amazing they were! I wish for health and happiness for me and my family. I wish schools had more funding so that teachers could get whatever their students need without draining their own pockets. I also wish that there was more money in general to offer transition houses for those students in low income families to continue their education after 21. I wish that my students know they are loved, and that I want the world for them! I wish for health for my family, my students to know and understand the lengths I go to in order for our classroom to be warm, inviting, and safe. I wish for kindness to be normal again. I wish for universal healthcare so I can stop worrying about how to afford to keep healthy and my students and families have access to affordable healthcare services to keep them healthy and ready to learn! I wish that the world would always assume the best intentions. That is how I run my classroom and my household! It’s definitely a challenge in our society! I wish people could have compassion for other people, no matter who they are. I wish that more people would take time to look up at the beautiful starry sky. So peaceful! I’d like to see the Northern Lights! I wish for more time in the day! I wish I could protect my students and let them worry about kid problems and not adult problems even when they are not at school! I wish I could stay in 1st grade next year! I’m being moved to a different grade. ???????? I wish that every kiddo I see to be loved, every second of the day and for others to see their strengths the way I see them. I wish my students always felt confident in themselves. I wish district mandated testing would go away so that students could truly shine instead of stressing over the pressure to pass a test! I wish my kiddos knew that they can keep reaching for the stars and make their dreams come true. My wish is to restart my life in a new house, with my kids and the love of my life. I wish for peace in this wild and crazy world and for everyone to have enough. I wish that my students would hold on to the love and excitement for learning that they have in 1st grade for the rest of their lives! What an amazing world it would be for them if they did! I wish if my students learn one thing from me it’s to always to be kind to one another and be honestly never to lie. My wish is to some day be a children’s book author! I wish that each of my students feels loved and accepted for who they are and that they likewise love and accept others in return. I wish for no more diabetes and asthma. Although I’m thankful that with my knowledge of both I am able to help educate others on them. And it has helped some of the families at my center be more at ease knowing that there is a teacher who understands what their child is going through. Better compensation for ALL teacher’s profession!!!!!!! Also, make child care more affordable for ALL parents!!!!!!!!! To become a parent soon (via IVF)! I wish that each of my students leaves my class knowing they are cared about and important, and that I help them see themselves as a part of the larger world. I wish for time for true, authentic teaching for our little ones. More storytelling, counting and imaginative play, not testing. I wish I had more resources to help my students get on or close to grade level. I wish that I could rid my son of all the effects of encephalitis so he could be an awesome kindergarten teacher again! I wish my kids always know they are loved, even when times are tough. I wish everyone could know and experience the joy I feel as a preschool teacher. I wish that my students will know just amazing they are! I wish for inspiration as I teach my pre k class. I wish for respect for teachers, children and their families as we work together to get ready for kindergarten. I wish children weren’t abused in any way and when they are-something was done about it. I wish for peace and happiness in the world and a life filled with peace and contentment. I wish every child had the confidence in themselves to accomplish great things! I wish I had more money to help support schools. I wish I could buy a new house to have family and friends over all the time! I wish I could guarantee that every child who goes to middle school could read! In every state! Every city! I wish that everyone in my family would be happy and that we can take a fabulous trip together soon. We have had a tough time for the past two years, I wish for happiness soon. I wish for health, happiness & strength. I wish that no child is ever bullied – that I could I get new playground equipment for my Pre-Schoolers – and of course win the Lottery!! I wish I could give my neediest students the skills and resources they need to be successful! I wish to always leave a child feeling cherished! I wish that I had more time in the day to read to the kids more. They love listening to stories and the day only limits how many we can enjoy together! I wish I could update our at home library. I wish people would be kinder to each other, and take care of the earth. I wish that I could become financially independent so I could spend the money I’d like to on my classroom. My wish is that when students leave me class they learn to be kinder and make the world a better place. I wish I lived where it never snowed. I wish every classroom had unlimited resources. I wish I had the time and money to provide for all my students. I wish my students realized how important their education is. I wish that all my students had to worry about was being a kid. I wish that everyone had enough to eat. I wish that I could help all my students learn to love reading and reach their full potential. I also wish I lived closer to my family to be a more active Aunt with my nephew. I wish my students’ parents could see how much I love their kid and really am doing my best, and how much I worry and stress over their child being successful. I wish I was able to reach ALL of my student! I wish we could stop teaching to the state standardized tests and take the time to really teach what the students need. I wish that my students will always enjoy school and never give up!! Success, however it looks for each one, and happiness for each of my students. I wish so many things as a teacher, but if I could truly get my wish granted I would wish for kids to all come from loving, economically safe homes. I get so anxiety ridden over being their safe haven and safe place when it should be the other way around. It’s so sad but unfortunately truer many know. I wish we could just focus on teaching the students without all of the testing! I wish for teachers to be valued and respected again. We are able to do so much more for our students when we have the respect from parents and community. I wished my students knew how much I cared for them and that when they get older they have lots of great memories from first grade. That my students believed in themselves as much as I believe in them!!! I wish every child loved to read. I wish all children could love a good book! I wish that all children could learn without having obstacles in their way. Abd that I always had the resources to help those children who do. I wish all of my students felt safe, fed, loved, and nurtured at home, so that they could come to school ready to learn. I wish they all believed that their today and tomorrow could be amazing! I wish educators (especially early childhood educators) were more respected. Also, for each of my students knew how much they are loved! A wish of mine is to be able to touch the lives of every student I teach in a manner that they need. I wish daily to be be the person that cheers them on to be the best they can be. I wish all children had a hunger for reading. I wish that, for just a moment, I could glimpse into my students’ futures and see what they will need so that I could plant the right seeds. My wish is to be known as a “safe space”, where any student can confide in me. I wish for all of my students to continue to believe in themselves as they grow older and are faced with more difficult obstacles. I wish that my students will always have the confidence needed to reach for the stars, and empathy towards others as they make the world a better place. I wish I could fill my classroom library with a ton of brand new books for my little kindergarteners! I wish for more time with my kids when they are little. I wish that all my kids through the years will realize they are important, valuable, and worthy! I wish that they take that with them for their whole life to help them reach their full potential! I wish that I had duck feet and I can tell you why. You can splash around in duck feet, you don’t have to keep them dry. I wish I could teach my kids without all the pressure of state testing. My wish is that my students feel loved everyday they walk through my classroom door! I wish parents would be more involved in their child’s education. I wish all students went to school happy; not hungry, not scared of bullying, not sad about family problems. I wish every child would find “that” book that hooks them early! I wish I had more time to help esch student with their problems. Whether its something personal or something education related. I wish every one of my students had someone at home who would show they care by talking with them, reading to them, and being a cheerleader for them when things are hard…. I wish all my son’s wishes would come true!???? I wish every person could see the whole world will knock a person down. We as humans need to learn we do so much better by building people up!! Love starts with you!! I wish I had more time to do more read alouds, and that more of my students could have someone read to them every night at home too. I wish to always have the motivation I have now to continue to bring knowledge to little minds through so much creativity to keep them involved! I wish that all of my students are happy and feel comfortable and safe and school and home. I wish that they have happy lives and enjoy learning and that all of their dreams come true! I wish I had starboard capabilities or more tech. its a constant effort to keep kids connected with minimal tech…. books and paper doesnt do it anymore!